A popular Pacific Beach restaurant is getting a second chance after being forced out of their home. 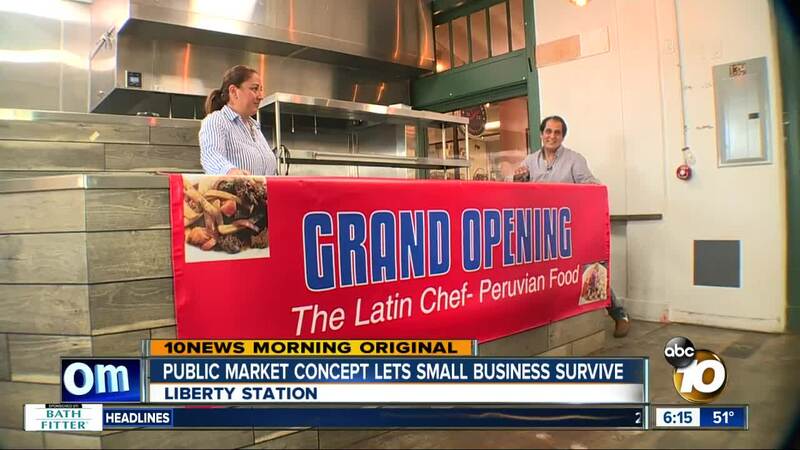 The Latin Chef is moving into the Liberty Public Market. The owner says it's a way to cut costs without sacrificing quality. Industry leaders say they can see other small businesses following suit. POINT LOMA, Calif. (KGTV) - A popular Pacific Beach restaurant is finding new life in Liberty Station, and it could be a sign of things to come for the industry. Latin Chef was forced out of its longtime home on Garnet Avenue in January. This Saturday, it will reopen at Liberty Public Station. "There's not much," says owner Fredy Palma of his small space in the market. "But you won’t believe that very tasty food is going to come from here." Palma says his rent will be about half of what it used to be in Pacific Beach. He also says moving into the Public Market means he no longer has to worry about all of the little things that come along with having a brick-and-mortar location. "Things like trash, telephone, light, SDG&E," he explains. He says this will let him focus more on the food and customers. It will also bring more foot traffic than what he had on Garnet. Executives at Blue Bridge Hospitality, which owns Liberty Public Market, reached out to Palma after seeing a story about his struggles on 10News. "I was listening to how he was having to vacate his space and thinking, wow, this seems like a perfect fit for Liberty Public Market," says David Spatafore with Blue Bridge Hospitality. Typically, Blue Bridge Hospitality had offered spots at the market to new businesses. Latin Chef will be the first established restaurant to move into the space. "Overhead keeps going up and up and up," says Spatafore. "The idea behind the Public Market is it’s kind of a condo association of retailers and restaurants to lower overhead and share expenses, making it a little easier for them. Certainly, I can see this being a wave of the future to lower overhead because there aren’t many options left." The public market concept has grown in San Diego over the last few years. Liberty Public Market opened in 2016. Since then, Little Italy has gotten a similar Food Hall, and North Park is expecting the Dam Public Market to open.
" I think you’ll see small markets pop up throughout in kind of that communal living spirit in communities throughout San Diego," says Spatafore. For Palma, it means he gets to keep making the food he loves.